Ah (or ah-choo)! Spring is here and flowers are blooming on the trees. What perfect weather to enjoy nature's colorful display and spend time with friends. In Japan, this time of year is celebrated by the tradition of hanami, flower viewing. Hanami parties often consist of eating or drinking outside, under the flowers, in the company of others. The flowers usually being viewed during hanami are those of the ume (plum) and sakura (cherry). Springtime also brings Hanamatsuri, flower festival, also known as Kanbutsue, the birthday of Siddhartha Gautama, who became enlightened as Sakyamuni Buddha. Hanamatsuri and Kanbutsue may have merged into one holiday in the Meiji Era (1868-1912). Many Nikkei, Japanese-Americans, celebrate the Buddha's birthday as Hanamatsuri on April 8th. On April 8th, 2017, the Department of Anthropology Museum put on an exhibit at the Davis Cherry Blossom Festival at Sudwerk Brewery in Davis, hosted by Sudwerk and Bakuhatsu Taiko Dan, the collegiate taiko group out of UC Davis. Also on exhibit were artifacts from the Consulate General of Japan in San Francisco, including usu (mortar) and kine (pestle) for mochi pounding that the public could try out hands-on. Even if you weren't able to make it to the Davis Cherry Blossom Festival this year, you can enjoy this online exhibit of the artifacts that were on display. These artifacts showcase aspects of Japanese material culture and explore some other early year festivals, from New Years through springtime. Museum display case at the 2017 Davis Cherry Blossom Festival. These festive fish are hung during the months of April and May, especially on Children’s Day, Kodomo no Hi, on May 5th. Though the meaning has changed over time, the largest two fish (black and red) are said to represent the father and mother, and the increasingly smaller fish represent a family’s children. 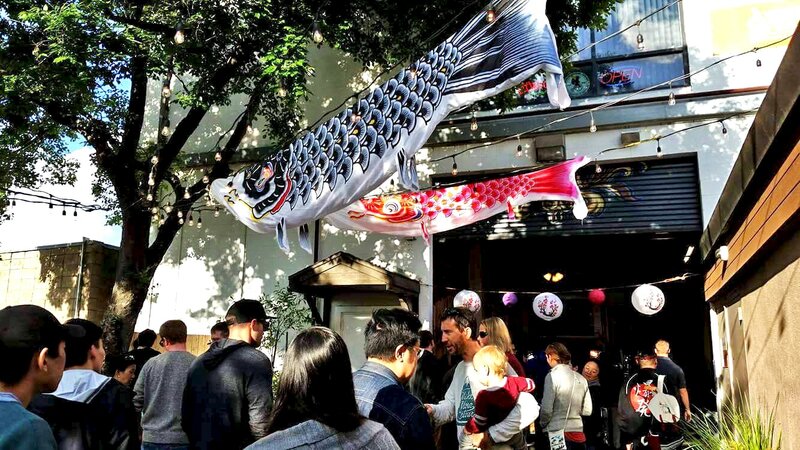 Koinoburi, on loan from the Consulate General of Japan in San Francisco, fly above visitors at the 2017 Davis Cherry Blossom Festival. The hagoita is a paddle used to play hanetsuki, a badminton-like game. Highly decorated Oshie-hagoita such as this appeared in the Edo Period (1603-1867) and are traditionally displayed at New Years in honor of a family’s daughter. The padded cloth picture, oshie, often depicts scenes from kabuki, traditional Japanese theater. Many shrines and temples in Japan have an office where visitors may go to get their goshuin-cho stamped. 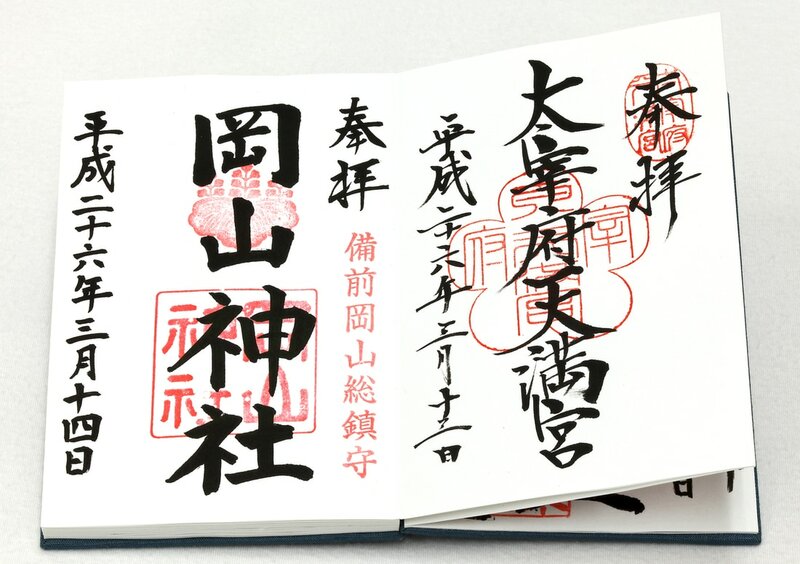 Each page represents a visit to a temple or shrine, and is inscribed with information pertaining to the temple or shrine such as its name, its rank, its unique message, and the date of the visit. Historically, these books symbolize a person’s devotion and may have originated as proof of copying a sutra or making a pilgrimage, and are sometime burned with an individual at death. Today many people collect stamps secularly or for tourism alongside religious practitioners. Left page: seal from Okayama Jinja. Right page: seal from Daifuzu Tenman-gu. 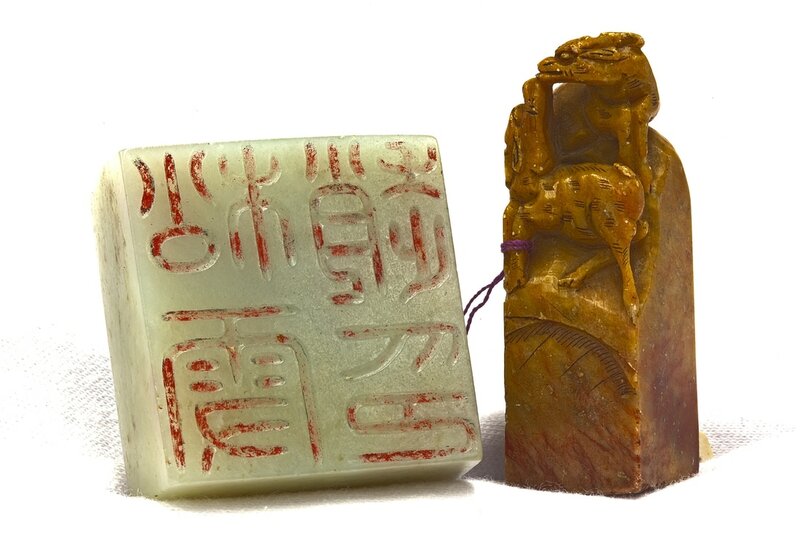 Seals like these serve as signatures for individuals or for places like temples. You can see the beautiful inkan (stamp) of some temples on the goshuin-cho. These stamps often have highly stylized or old kanji (characters). The animal depicted in the smaller hanko is a kirin, a mythical creature resembling an deer and a dragon. These ornamental balls were originally made from scraps of kimono, and could be used in a game. Traditionally, a mother would place a wish for her child in the layers of the silk and give the ball to her child on New Year’s Day. Today, they are highly crafted works of art, and often given as fancy gifts. This ball was presented to Donald Knuth (The Art of Computer Programming), winner of the Kyoto Prize. Temari on display during the Davis Cherry Blossom Festival. These elevated wooden sandals are useful in keeping long kimono and yukata, what you might wear to a festival today, off the ground. The wooden teeth are 9 cm and 3 cm respectively for the adult and child pairs displayed here. The ha (teeth) of geta could be taller for rainy-days or messy professions like cleaning fish. The adult pair seen here are actually a pair for such rainy days. Some geta have only one tooth in the middle! Visitors to the festival this year got to try making mochi, a sticky rice cake, by hand thanks to a loan from the Consulate General of Japan in San Francisco. The demonstration was led by Mihoka Fukarai, pictured on left, of the Japanese Language and Culture Connection program at UC Davis. Mochi is a traditional food used in a number of celebrations, most notably New Years, where it is served in ozoni, a traditional soup eaten on the morning of New Years Day. Mochi is also used during New Years in kagami-mochi, a decoration for household alters consisting of a daidai orange resting a top two mochi. Mochi plays a role in some springtime holidays as well. Hishi-mochi is a three-layered, squared mochi used in Hinamatsuri, Girls Day, on March 3rd. Pink sakura-mochi, wrapped in a cherry leaf and filled with red bean, is used to celebrate Hanamatsuri. For May 5th, Children's Day, kashiwa-mochi is a special dish wrapped in oak leaves and filled with red bean. Chimaki, a sweet rice paste wrapped in the leaves of an iris or bamboo, is another food enjoyed on this day. ​Taiko, literally big drum, refers to a type of instrument developed in Japan. Early drum forms probably entered Japan from Korea or Southern China by the 6th Century CE and developed in Japan in contexts of religious ceremonies, court music, theater, communication, and festival music. In North America, it is most recognized as kumi-daiko (組太鼓), ensemble drumming, which was developed in post-war Japan by Daihachi Oguchi, a jazz musician with an interest in folk music who transcribed traditional taiko music into modern arrangements. In Japan, traditional taiko are made from solid body wood with heads of cow or horse leather. Many North American taiko groups use wine barrels for drum bodies, like the chu-daiko (medium drum) pictured on the left. Though adopting modern materials, many aspects of the traditional drum construction process continue in taiko groups around the world, including Bakuhatsu Taiko Dan, the collegiate taiko team out of UC Davis. In the United States, the rise of taiko was an expression of the sansei (third-generation) Japanese-American experience. Inspired by the Civil Rights movement and faced with the history of internment and the model minority myth, taiko became a medium for Japanese Americans to express cultural identity. Today, the growth and popularity of taiko can be found on college campuses and community groups across North America. Kumi-daiko performance by Bakuhatsu Taiko Dan, collegiate taiko group at UC Davis. Photo by Diane Neilson.